COFFEY BREAK: Developing a rapport with students, such as Craig Stanford (left), is an important part of his teaching, says Coffey, who won the Rochester City School District’s Career in Teaching Award for First Year Teachers in 2010. (Photo: Adam Fenster) More . 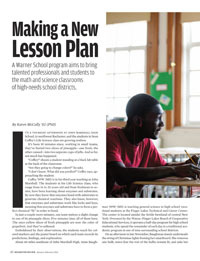 . .
A Warner School program aims to bring talented professionals and students to the math and science classrooms of high-needs school districts. Part of a vibrant a cappella scene at Rochester, the YellowJackets find fame on a national stage while giving back locally and internationally. With a new degree program in New York City as well as new degrees in health care and technology, Rochester aims to meet the needs of students looking for master’s level education. Did you find your heart at Rochester? In the spirit of Valentine’s Day, we ask a small sample of alumni couples to tell us their stories.